When I talk to the dead, sometimes I talk to people I know, like my grandmother. Other times I talk to women who I don’t want forgotten, like the immigrants who didn’t make it across the border, or the reporters—like Felina—who died covering narco violence, or the disappeared in Tamaulipas, Mexico. I talk to them in my writing, in my research and through my stories. Sometimes I talk to them in what Catholics would describe as prayers, and which Brujas (the Spanish word for witch) would describe as spells. I’m not alone in this practice. I’m going to tell you a story about Brujería, Curanderismo, and the local Latinx artists finding their voices in these alternative spiritualities. And I’m not going to italicize the words from my culture. Let the words wash over you, and maybe, this story will help you learn to listen to voices we once thought were silent. 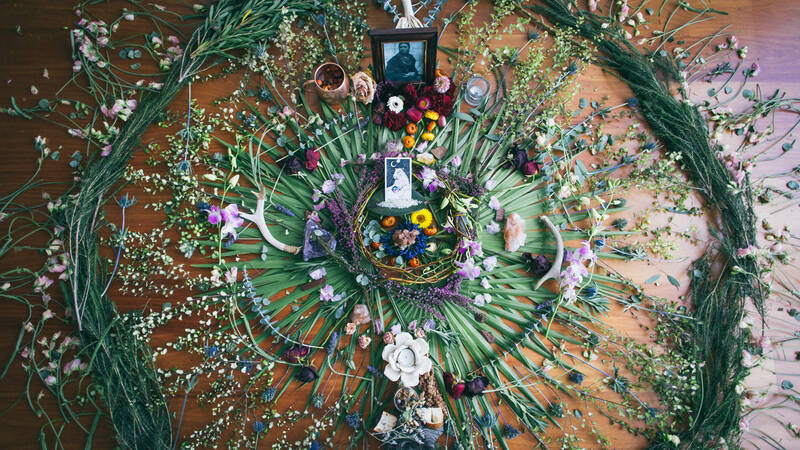 You can find active Brujería communities practicing forms of Latin American witchcraft and engaging in Curanderismo (folk healing) in the American Southwest, Latin America, the Caribbean, and throughout California. These spiritualities give disenfranchised people a sense of community and a way to voice their resistance. Recently, the influence of Brujería and Curanderismo can be seen in both pop culture and politics. Orichas, or Santería folk saints, made cameos in Beyoncé music videos, while witches across the Americas cast spells against Trump every month to remove him from the White House. More traditionally, Curanderos, those who engage in folk healing, pray to Catholic saints and practice herbalism. Others channel the dead in order to heal their patients, taking the illness or evil into their own bodies. The “performance” of healing, and the relationship of trust or faith between Curandero and patient is as important to the healing process as the medicine itself. 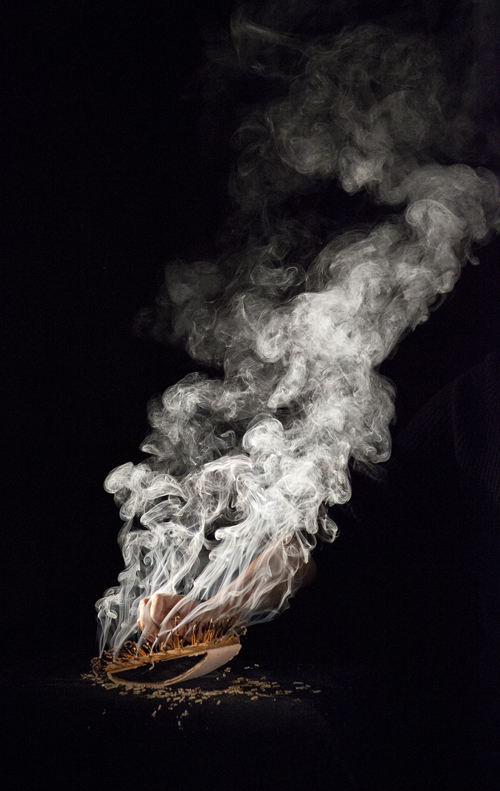 For Latinx of the Bay Area, Brujería and Curanderismo connect us to a history in which our ancestors resisted colonization and found ways to keep their stories and spiritual practices alive under the guise of Catholicism. By practicing rituals, herbalism and folk healing, we are honoring our ancestors, and retelling our stories in our image. And as we write these stories—through film, fiction, sound and image—more and more Latinx artists in the Bay Area are paying homage to the Brujas and Curanderas who inspire their art. Colombian-born, San Francisco-based writer Ingrid Rojas Contreras is the author of Fruit of the Drunken Tree, a novel based on the writer's life, centering on two young girls who are split apart in the wake of violence in Colombia. (She is also a regular KQED Arts contributor). Curanderismo is not only a prominent subject of her writing, it plays a vital role in the actual telling of her stories, which employ magic realism. Her grandfather was a Curandero in Colombia, and the people of his town still prayed to him, even after he passed away. Rojas Contreras’ mother often assisted her father in his healings, although she does not consider herself a Curandera. It's important to note that there is a difference between Curanderos, practitioners of herbalism, and laypeople. While Rojas Contreras' mother was not a Curandera, she did pass on aspects of her father's knowledge to family members. 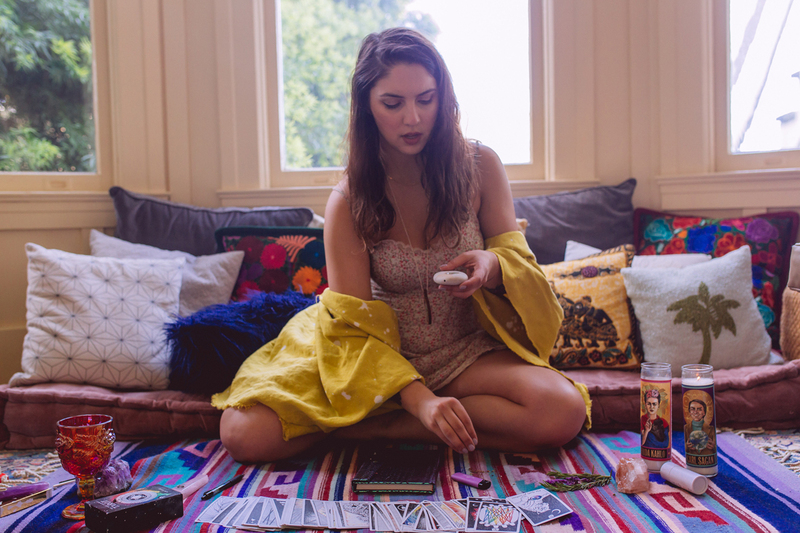 When Rojas Contreras was a teenager, her mother taught her how to use a regular deck of cards for divination, similar to the tarot, and to give readings. How Curanderismo or Brujería translate into an artist’s work completely depends on an artist’s relationship to their spirituality. For Mexican-American and Jewish filmmaker Nina Reyes Rosenberg, Brujería was a jumping off point for her short film, Invisible Men, which recently premiered at the Roxie in San Francisco. Invisible Men is a story about a young woman living in a #MeToo world. Disgusted by men, she visits a botanica to confide in a Curandera that she wishes all men would disappear. When she wears rose colored glasses, her wish comes true; she and her girlfriends rule the streets, dancing to the beats of reggaetonera Ms. Nina. 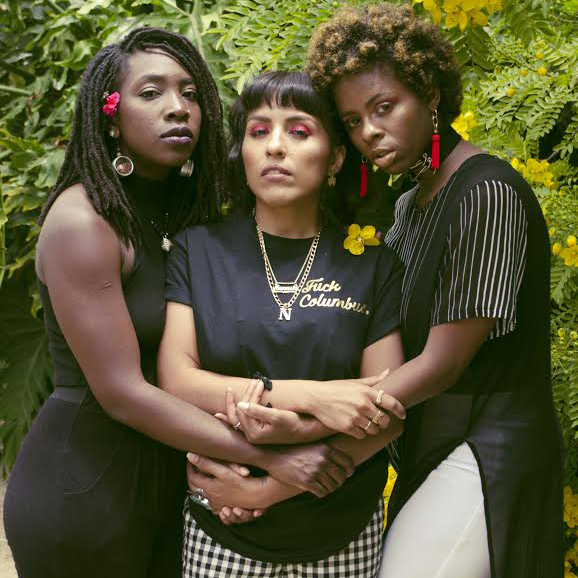 Oakland-based Salvadorian DJ and radio producer Noamy "NoNo" Henriquez co-hosts Las Brujas Radio along with rapper Queens D.Light and activist Imani Atlantic. She found her spirituality, Lucumí, after a period of searching. Lucumí is synonymous with Santería, but many practitioners of the Afro-Caribbean tradition prefer to call it La Regla Lucumí or “the order of Lucumí,” because the term Lucumí derives from a Yoruba greeting meaning, “my friend,” instead of centering around the Catholic saints in Santería. In Las Brujas Radio, the three women hold space for each other, make room for self healing, and build community with femme-identifying listeners. A recent program called “Anger Faire” dealt with intergenerational trauma and anger transference, as well as the ways in which gentrification is particularly triggering to people of color, refugees and the continuously dispossessed. 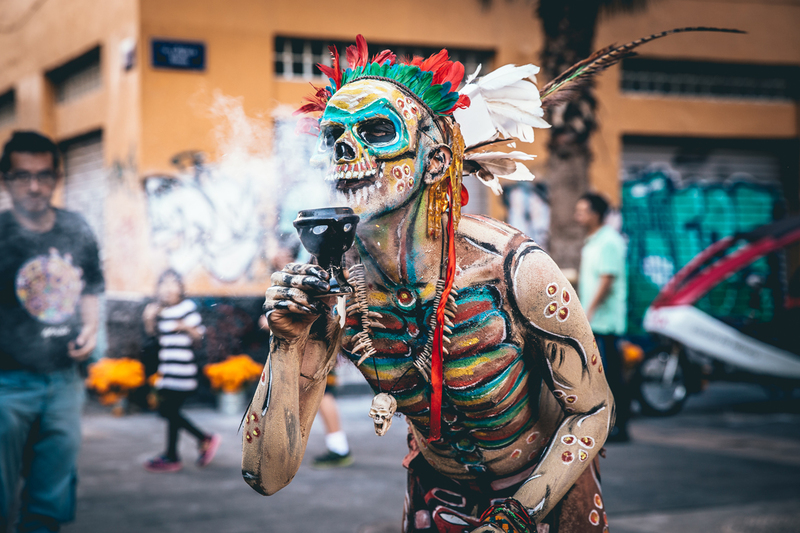 In recent years, Bakrevski’s covered Día de los Muertos in Mexico City, documented rock alternativo acts, and captured images of the Cuban underground. In her work, she is making space for herself, covering Latinx culture in the male-dominated industry of photojournalism. In my prayer and in my writing, I try to listen to the Latinx women who came before me. I try not to talk over their voices. I have an altar where I honor the women who have fallen, women who inspire me and women with unwritten histories. And each day, I try to write a page dedicated to them. Sometimes, the writing is very, very broken. Other times it’s poetry. But I am learning to listen to these women, and give them the space they deserve on the page. I am trying to write them into the spell of memory. When I listen to the words of the women who translate Brujería into their art, I hear a calling. The calling is to create, to act and to show up, especially for other women, especially for women of color. All of the women I interviewed in this piece are holding a sacred space, and teaching us how to hold our own. Because when you honor spirits, you aren’t just honoring your ancestors, but the spirits all around you, who are empowering you to be free.